Paradise Valley Unified School District Saves nearly $650,000 per year in Employee Benefits Fixed Costs! 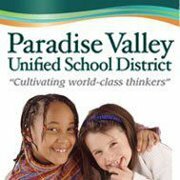 At a presentation on November 1, 2012 at the Paradise Valley Unified School District (PVUSD) made by the Valley Schools Management Group (VSMG), it was shown that PVUSD is saving nearly $650,000 per year in employee benefit fixed costs alone through its membership in a group purchasing trust. By group purchasing, fixed costs are reduced dramatically. PVUSD is also self-insured, which means it only pays for the actual cost of paid medical claims, it does not pay any carrier or organization any extra profits, add-ons, or “wiggle room” pricing on its claims. This saves them even more money, as the medical claims are about 90% of the expenditures, while the fixed costs are only 10%. Kudos to the administration and Governing Board of PVUSD for their outstanding decision to save dollars on benefits in order to keep precious resources for teachers, staff and dollars in the classroom! Sue Skidmore earned a Bachelor of Arts degree in English from Mount Union College and a Master’s degree from Youngstown State University. She also holds a doctorate in educational leadership from Arizona State University. Dr. Skidmore has been a public school teacher, high school principal, and school district superintendent and has taught at the university level. Additionally, she is the founder of a Web-based company that specializes in enhancing grammatical and writing skills and has co-authored three English reference books. She has been actively involved in the district’s United Parent Council, serving two years as its co-president. Dr. Skidmore is in her third term on the Governing Board and has served three years as Board president. She has two daughters who are graduates of PV schools. Her term expires in December 2012. Nancy Case received a Bachelor of Science degree in Retailing from Brigham Young University in 1978. She and her husband, Art Case, are the parents of seven children, ages 6 to 26. All of their children have either graduated from or are currently attending Paradise Valley schools. Mrs. Case has enjoyed volunteering in her children’s schools. She has also tutored many students and taught reading classes in her home. She loves to teach. Her term will run through December 2012. Anne Greenberg earned a Bachelor of Science in Journalism from Northwestern University. She is co-owner and executive vice president of Health & Medical Multimedia, as well as the editor of two publications for the American College of Cardiology. The webmaster for the United Parent Council, Mrs. Greenberg is a member of the district’s Community Legislative Network and has served on numerous district and school committees. She also is a member of the state board of the Arizona Academic Decathlon Association and of the Legislative Committee and Arizona Relations Network for the Arizona School Boards Association, which honored Mrs. Greenberg with an All-Arizona School Board award in 2011. Mrs. Greenberg and her husband, Rick McGuire, have two sons, one who graduated from and one who currently attends Paradise Valley schools. Her term will run through December 2012. Mark Lane owns a photography business, and studied business administration and accounting at Phoenix College, University of Arizona and Northern Arizona University. He and his wife, Debbie, have a daughter who attends a Paradise Valley school and two daughters who graduated from NAU and ASU. Lane is a Shadow Mountain High School alumnus and has been an active volunteer in the district and community through school council, United Parent Council and Little League. His term will run through December 2014. ← What’s Really in My Pet’s Food?